Have you ever prayed for something in your life and never received it or had to wait way beyond what you expected, to receive it? Have you possibly given up praying for something thinking maybe it was not the Lord's will, only to be given it at a time when you least expected it? How did you feel after such a long time, having not received it? Did it test your patience, your faith? Did you begin to question God? What scriptural examples can we recall of such events - Lehi and family and promised land. Moses, let my people go. Joseph in Liberty Jail? Today we will study another example of patience and faith being tested, with Zacharias and Elisabeth. Have you ever received a calling that you felt overwhelmed by or that you felt was way beyond your capacity? Did you say no? Did you accept it but with reservation and doubts? How did you respond? If you accepted it, how did you do? What scriptural examples can we recall of such events? Abraham and Isaac, Samuel in the temple, Joseph Smith? 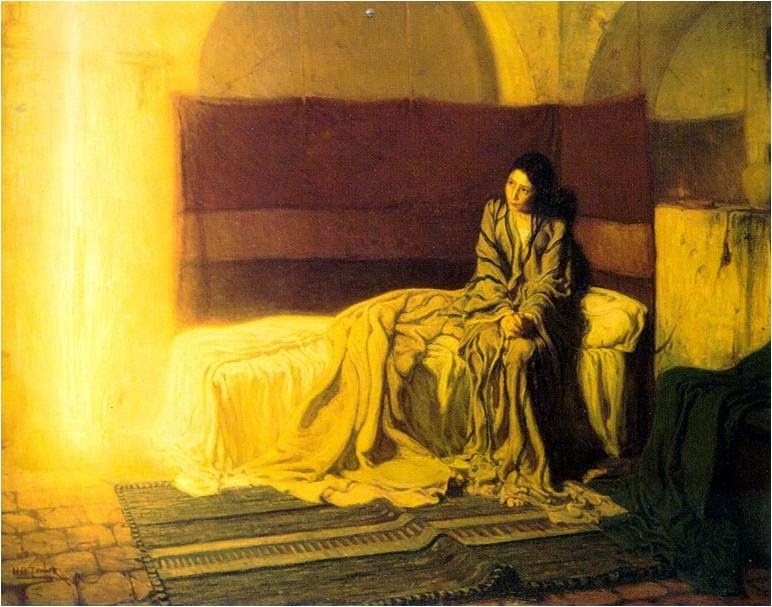 Today we will study how two young teenagers, Mary and Joseph, responded to possibly the most overwhelming calls of all. The annunciations of Luke 1 are a story of two impossible births. A birth to a couple too old and beyond hope of new life. And a birth to a couple not yet wed.
Could it be this story also sends a message to the Jews and the Gentiles. The Jews were the old covenant that were losing faith in ever seeing their promised Messiah and while religiously obeying their duties no longer believed maybe as resolutely in the spoken words of the prophets. The Gentiles were not part of the promises and covenants and had no right to be expecting a Messiah and yet through their faithfulness and obedience became highly favoured of the Lord and eligible for the new covenant. As you study this lesson, consider the symbolism that Luke may have been pointing to in the beginning of his testimony. 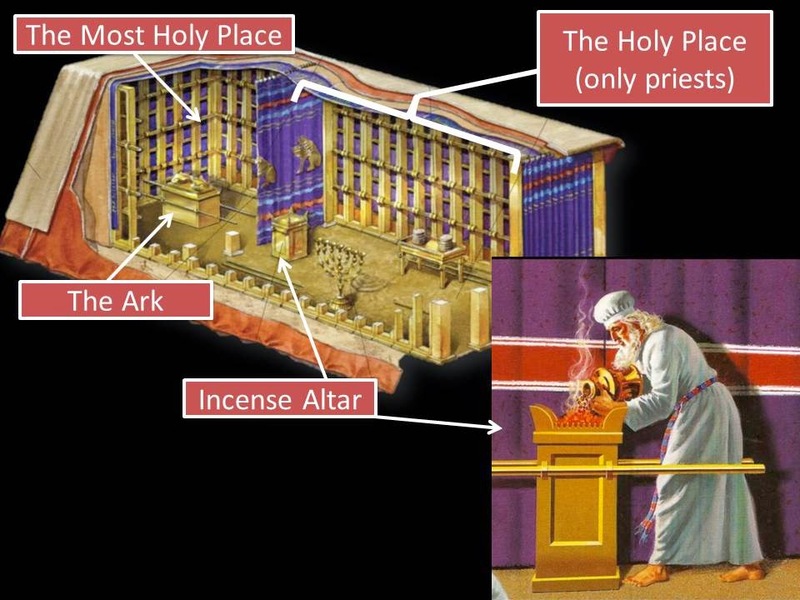 "Live coals were brought from the brazen altar of burnt offering and placed on the golden altar of incense; then the priest entered alone into the Holy Place, carrying in a censer the incense, which he cast on the fire. Then bowing reverently toward the Holy of Holies, he returned to the congregation, who were praying outside and pronounced the blessing in Numbers 6:24-26"
This was what Zacharias was doing when Gabriel appeared to him. "Fear not, Zacharias: for thy prayer is heard; AND thy wife Elisabeth shall bear thee a son"
It is commonly interpreted that the angel Gabriel is answering a prayer that Zacharias has prayed for years and had built up to in this seminal moment of personal prayer in the temple before the veil but all the evidence, including Zacharias' doubting reply, is that the angel Gabriel was indicating the temple prayer on behalf of the people was heard, Zacharias' prayer of a righteous life was answered and that it was his life's deepest desire that was answered as opposed to any specific faithful prayer he was offering in that specific temple trip. How symbolic though that it is at the altar of incense by the veil that the Lord sets in motion the events that would ultimately answer the prayers of the people and the deep desires of this righteous servant and his wife. Why would the Lord choose this setting and this time to make this announcement? What does this teach us of the manner of prayer, the power of prayer, the purpose of prayer? What a great blessing! As you read the blessing pronounced by Gabriel regarding the unborn John, what stands out to you? For me, one of the amazing parts of this blessing is that Zacharias is told his son will be "filled with the Holy Ghost even from his mother's womb". Was this a gift given to him prior to baptism or just an abundance of the Spirit? I find it a fascinating blessing. What was the purpose or point of such a blessing? he's righteous, he's prayed for it many times before in his life, it is probably the one thing he desires most in his life and he's in the temple speaking to an angel and he asks "How will I know this is actually true!?" You might say he was dumbfounded? and so Gabriel(Noah) says "Are you kidding me? I am Gabriel, an angel sent from God's presence to answer your prayers with this good news here in the temple in front of the veil before the holy of holies and you dont believe me? You want a sign? OK sure, your sign will be becoming dumb until these prophecies are fulfilled. For all his questioning, you cant fault his dedication - he heads home AFTER his duty is done and then Elisabeth conceives. In the 6th month of Elisabeth' pregnancy, Gabriel visits a young virgin called Mary - you know Gabriel must be loving this role of announcing special births when compared to his mortal ministry where he had to watch so many people die. And now he announces the births of those set to bring about their salvation. God is good. Why do you think Gabriel was selected to be this messenger? What symbolism do we see here in comparison or in conjunction with his mortal ministry as Noah where he was asked to herald the world into a new era? v28-29 she was troubled and "cast in her mind" what this greeting meant. Mary is also the one we are told later who at her son's birth and all the events surrounding it, "kept all these things and pondered them in her heart" (Luke 2:19). This appears to be a very thoughtful and careful young woman. What blessing does Gabriel pronounce regarding Jesus prior to his birth? Luke 1:31-33. That would be very overwhelming for a young woman (similar to the calling of Samuel in the temple or Joseph in the grove of trees). Her response again shows a very studious mind. Her reply is not a doubting reply but the reply of one who wants to understand and learn. How will it happen? I am a virgin and already espoused to Joseph. v.35 For those of like mind to Mary the answer is fairly straightforward - "The Holy Ghost shall come upon thee, and the power of the Highest shall overshadow thee". I still don't know what exactly that means but the conclusion is very clear, "therefore [thy son] shall be called the Son of God". v.38 Mary is espoused to another man, this certainly means divorce and quite likely death according to the laws and how these events will be interpreted by those around her and yet her response to this is one of humble acceptance. "Behold the handmaid of the Lord; be it unto me according to thy word"
Mary offers full submission to and complete acceptance of this calling no matter the effects on her personal life. How can Mary's example help us to make better choices in fulfilling our callings in life? 39-55 can you imagine this scene - not only two mothers announcing their news but wow what news! Note too that even in womb John was filled with the Holy Ghost. 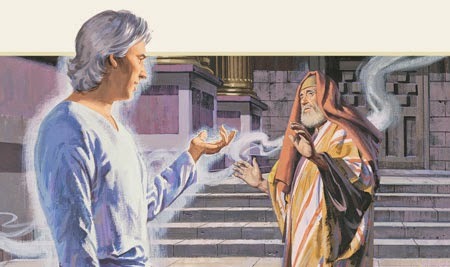 One of the roles of the Holy Ghost is to testify of Christ. Is it any wonder the unborn baby John therefore reacts in the presence of his Saviour? That must have been an amazing experience for Elisabeth. What does it mean "my soul doth magnify the Lord?" How can we magnify the Lord? Mary stays with them about 3 months but leaves before John is born. But now consider. She left Joseph for 3 months right at the time of conception and during that first trimester. Why? Matthew 1:19 he had respect for her and not going to have her stoned or publicly mocked but he was going to quietly divorce her. This must have been a very trying time in their relationship. It must have been tough for Mary and for Joseph for different reasons. v.20 I wonder at what stage this happened? Was it after Mary returned? the text suggests it was. Certainly Joseph didn't rashly react. He was thinking on these things for a while. Jesus obviously had earthly parents who were slow to wrath and pondered and prayed. They too are told to give the child a specific name Y'shua or in Greek (Jesus) means to save. Joseph's reaction to his angelic visit? Obedience without question and total respect for Mary. This must have been a hard calling for Joseph. To be the adoptive father of the Son of God. To accept a child that is not yours. Yet he responded to the call. “All the spirits of men, while yet in the Eternal Presence, developed aptitudes, talents, capacities, and abilities of every sort, kind, and degree. During the long expanse of life which then was, an infinite variety of talents and abilities came into being. As the ages rolled, no two spirits remained alike. Mozart became a musician; Einstein centered his interest in mathematics; Michelangelo turned his attention to painting. . . . Abraham and Moses and all of the prophets sought and obtained the talent for spirituality. . . .
We all have the ability to perform our callings in life. We may have forgotten certain abilities and talents we had previously developed but the Lord our God has not. He knows us, he knows our capabilities and our strengths. It is for this reason many if not all of us were given callings in this life, duties to perform while here. Like Zacharias and Elisabeth we must do our duty. Like Mary we must be humble and submissive. Like Joseph we must be quick to obey. We must ponder and pray. Are we living the lives we were called to live?